I fell in love with Heirloom Tomatoes from my CSA in Del Mar, CA. Their ‘meaty’ flavor was incredible and at times, reminiscent of bacon (I’m not kidding). If a tomato could bring world peace it would definitely be the Heirloom. Their flavor is so incredible that nothing much needs to be done to bring out the flavor. 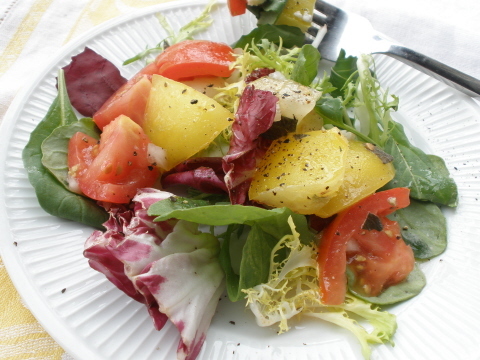 So, here is a delicate little salad that can be dressed up or down to accommodate few or many. The amounts of ingredients are vague but the flavor is incredible. Simple is truly better. Mix all ingredients and chill for at least 30 minutes before serving. If you wish serve over micro greens and sprinkle sparingly with blue cheese.